You are at:Home»Alternative ETFs»Biotechnology ETFs Growing…Like Genetically Modified Crops? 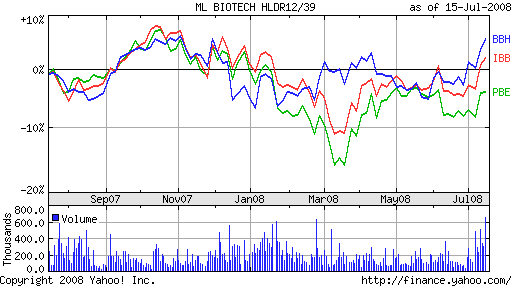 Biotechnology is the non-commodity exchange traded fund (ETF) area du jour, it seems. In a time where the markets seem bleak, the sector is delivering a ray of light. Genentech (DNA) this week upped its 2008 forecast, and also said its second-quarter profit rose 4.7%, thanks to high sales of a drug that treats tumors, according to the LA Times Business blog. Revenue was up 8%. The drug, Avastin, is used to treat colon, breast and lung cancer. It’s being studied against 20 other tumor types, as well. Genentech is the biggest maker of cancer drugs in the United States. Johnson & Johnson (JNJ) also announced a record amount of second-quarter sales at $16.5 billion, and profits of $3.3 billion. The numbers owed much to sales overseas, reports Rob Wherry for Smart Money. As evidence of the vast applications of the biotechnology sector, a roundtable conference was held to address the food crisis in sub-Saharan Africa. In Nigeria, agricultural growth is put at 4.5%, far below the growing demand for food there. The Minister of Science and Technology Chief called for increased use of genetically modified crops, which are being developed by the National Biotechnology Development Agency, reports Ekene Ezugwu for All Africa.